Speak with your expert licensed San Jose, CA water softener system installation and repair specialist today by calling Genmor Plumbing, Inc. at (408) 933-9874. Check out our latest coupons and specials by clicking here. Have a look at what other San Jose, CA clients have said about their experience working with Genmor Plumbing, Inc. Although hard water is safe for you to drink, it is quite harsh on everything from your appliances to your skin and clothing. Hard water carries minerals that can cause your skin and hair to dry out. If you have hard water in your home, you will also notice that your pots and pans, dishes and appliances get a build up of scale very quickly. Your clothing will likely appear dull after it has been washed. When minerals in hard water build up, they combine with oils in your hair, skin and clothing and create salts or scale that is left behind. This also causes spots and film marks on dishes that have gone through your dishwasher. Limescale deposits will also appear on your pipes and some appliances. An abundance of this build up can have a significant impact on how well your appliances work. It can even cause a blockage over time in various tubing and pipes throughout your home. A professionally installed water softener can solve your home’s hard water issues. A filter is installed that can eliminate the minerals that are present in your water. This takes away the harshness of the water and you will notice an immediate difference. Your hair and skin will feel better and softer. Your dishes, silverware, pots and pans will all be free from scale marks and build up. Your kitchen appliances will not get a buildup of limescale and you will notice a considerable change in the appearance of your clothing. 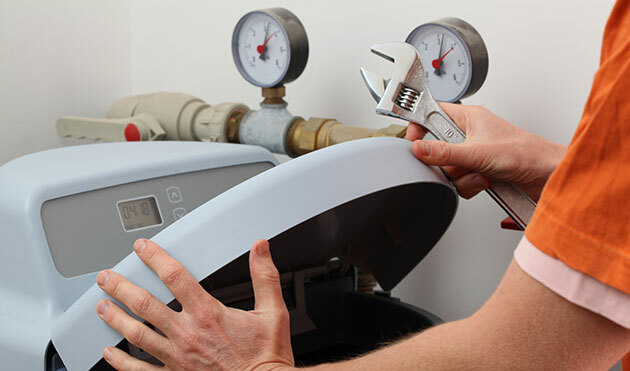 Installing a full water softening system in your San Jose home is a fairly large project that should be completed by an experienced professional. Even small installation projects can cause leaks in your plumbing system if they are not done properly. A large water softener requires an involved installation into the major water pipes of your home. A mishap in the installation process could prove very costly to repair. When Is Professional Repair Necessary? In some cases, you may be able to resolve minor water softener issues yourself, such as resetting the time of day (make sure to check your water softener after a power outage) or tapping on salt bridges that have formed. If the problem is beyond DIY fixes, we recommend calling for professional help. Your water softener is a convenient device, but it is also crucial to maintain it so you and your family continue to enjoy high quality water. If you notice any problems with your device or with the quality of water you are used to, don’t hesitate to call for a professional inspection. Our team will help you diagnose the problem and carry out a repair that gets to the source of the issue. You will be enjoying clean, fresh water in no time again! Speak with your licensed Genmor Plumbing, Inc. water softener repair and installation specialist today at (408) 933-9874 for urgent expert assistance. We provide you with a free estimate and our 100% Genmor Plumbing, Inc. satisfaction guarantee.